We all know the late Philip Seymour Hoffman was playing a very thinly veiled L. Ron Hubbard in Paul Thomas Anderson’s The Master. 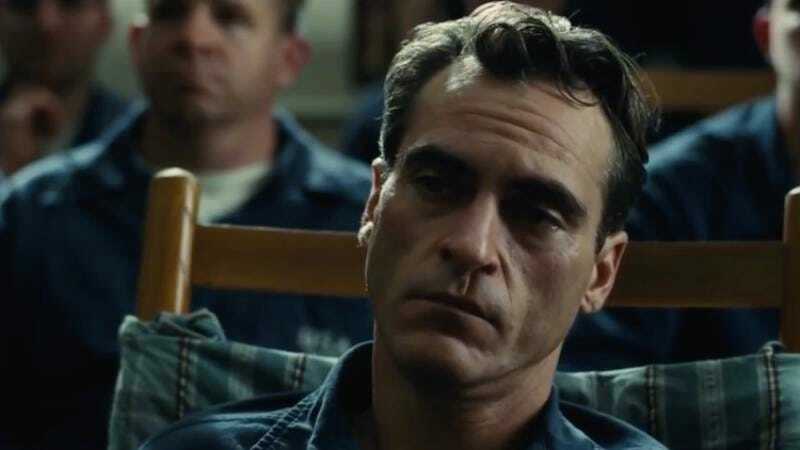 Less known is the fact that Joaquin Phoenix, following in the fine tradition of Rodney Dangerfield’s Rover Dangerfield and Tim Allen’s The Shaggy Dog, was straight-up playing a dog. That, at least, is the theory of Daniel Fairfax, a doctoral candidate in film studies and comparative literature at Yale and editor for online Australian film journal Senses Of Cinema. In a highly academic essay for Senses Of Cinema, Fairfax writes that Phoenix’ Freddie Quell, in his savagery, vice, loyalty, neediness, and fickleness, is at his very essence a dog. Fairfax does make some compelling points, for anyone whose eyes haven’t completely glazed over by the time they hit a passage like, “The becoming-animal is, for Deleuze/Guattari, an instantiation, if not the paradigmatic example, of a raft of concepts that will be of exceeding familiarity to Deleuzians” (it keeps going like that, segueing into “the molecular, the minoritarian, deterritorialisation, multiplicity, lines of flight and the rhizomatic”). In his reading of The Master, Quell is at heart a dog, and the struggle between the internal canine and the human inside him drives the whole narrative. We eagerly await the follow-up article on the Aristotelian viciousness of Spuds MacKenzie.